The DisplayMapNode displays height maps and vectors along the x and z coordinates. If no color is connected it shows a grey scale map for values between [-1, 1]. Uses red for values > 1. Uses blue for values < -1. Uses magenta for float.NaN values. Vector positions are drawn using white. + and - Resize the node. 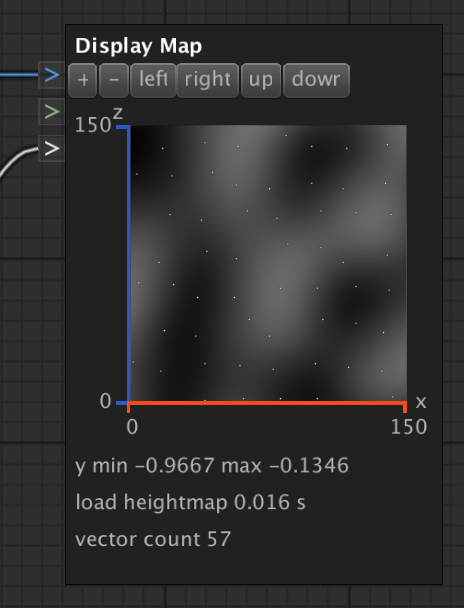 left / right / up / down Offsets the display position along x and z.
value The height map to display. color The color or color gradient for the height map. vector The vectors to display on top of a height map.